Honda's EV Concept electric vehicle and a platform for mid size plug-in hybrid vehicles will be displayed alongside the revised Accord range at the Geneva Motor Show. The concepts were unveiled at the LA Auto Show in November 2010 and will be shown at Geneva as part of Honda’s “Road to Zero Emissions”, illustrating the current technology of hybrids alongside the near-future technology of plug-in vehicles and the ultimate goal of Fuel Cell Electric Vehicles, like Honda’s FCX Clarity. The two new cars are integral to the Honda Electric Mobility Network, the company's comprehensive approach to reducing CO2 emissions through innovative products, energy-management and energy-production technologies. 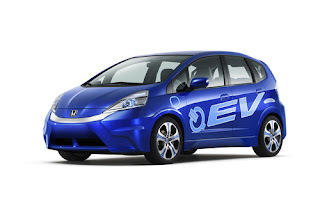 The Honda EV Concept hints strongly at the direction and styling for Honda's upcoming production battery electric vehicle, the Fit EV, which will be introduced to the U.S. and Japan in 2012. The all-new plug-in hybrid platform showcases Honda's next-generation, two-motor hybrid technology set to debut in 2012. The EV Concept is designed to meet the daily driving needs of the average metropolitan commuter and utilises the same 5-passenger layout found in the popular Fit hatchback (known as Jazz in the UK). The Honda EV Concept will achieve an estimated 100 mile driving range per charge using the US EPA LA4 city cycle. Driving range can be maximised by use of an innovative 3-mode electric drive system, adapted from the 2011 Honda CR-Z sporty hybrid. In addition to this, the Honda EV Concept will include several interactive coaching systems to assist the driver in maximising battery range. Alongside the Honda EV Concept will be a prototype Honda charging stand, providing a glimpse at the future of an electric-charging infrastructure that is easy to use and intuitive for consumers. Honda will also preview a plug-in hybrid platform, which showcases Honda's next-generation two-motor hybrid system. Integrated into a mid-size saloon platform, the plug-in hybrid is designed to be compatible with daily driving habits, allowing for short, frequent trips in all-electric mode, while providing long-distance driving capability when needed. The Honda two-motor system continuously moves through three different modes to maximise driving efficiency: all-electric, petrol-electric and an engine direct-drive mode. The plug-in hybrid also uses regenerative braking to charge the battery. The FCX Clarity will also be displayed alongside the two concept vehicles demonstrating its position as the ultimate solution to zero emissions mobility. The world’s first production fuel cell electric vehicle has been available to lease in the US and Japan since 2008. The revised Honda Accord Saloon and Tourer models will make their debut at the show. Both cars receive a host of changes including enhanced styling, emissions, ride and handling. The revised Honda Jazz marks the return of a CVT automatic transmission to the endlessly flexible B-segment hatchback. The Jazz Hybrid went on sale at the beginning of February 2011 and further demonstrates Honda’s continuing commitment to petrol-electric hybrid technology. The 2011 Honda Insight features revised suspension components and settings, specification changes and new exterior colours. The world’s first 6-speed manual hybrid coupe, the Honda CR-Z will grace the stand at the Geneva Motor Show. The CR-V equipped with the Euro NCAP award-winning Collision Mitigation Brake System, the Honda-developed autonomous emergency braking technology, will sit in the safety zone of the Geneva Motor Show stand.